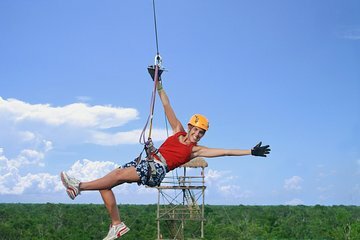 Spend the day exploring the Mayan jungle and Caribbean waters with this multi-activity tour. With all the details arranged in advance, you'll skip the hassle of booking each adventure individually. With a guide to take care of all the details and provide instruction and supervision, go snorkeling in a secluded cove and an underground river, then clip in for a ride down a super fast zip line. Weight limit: (135 kg.) 300lbs. Size: 44. Wear comfortable clothes and footwear. Bring water shoes, sunglasses, hat, swimsuit, extra T-shirt, towel & cash for pictures, souvenirs or tips. Use only biodegradable sunscreen and insect repellent. Snorkel and zipline activities are not recommended for infants under 4 years old. Infants must be supervised at all times. Basic swimming skills required. This tour is not suitable for people with severe physical or motor disability, serious heart problems, or people who are unable to handle moderate physical activity. People under the influence of alcohol or drugs will not be permitted to participate in this tour. Not recommend for pregnant women. Prescription goggles available under previous request. French, German, Italian and Portuguese speaking guides are available at different week days; please confirm with your NexusTours representative.